At 60mph, the guilder registers a quiet decibels on General Radio Company’s sound level meter. Earthbound Ford LTD at 60 mph registers an even quieter 65 decibels. At 60 mph this 1973 Ford rode quieter than an airborne glider. 1973 Ford LTD 2-door Brougham shown above with optional sidewall tires, deluxe wheel covers, deluxe bumper group and vinyl roof. 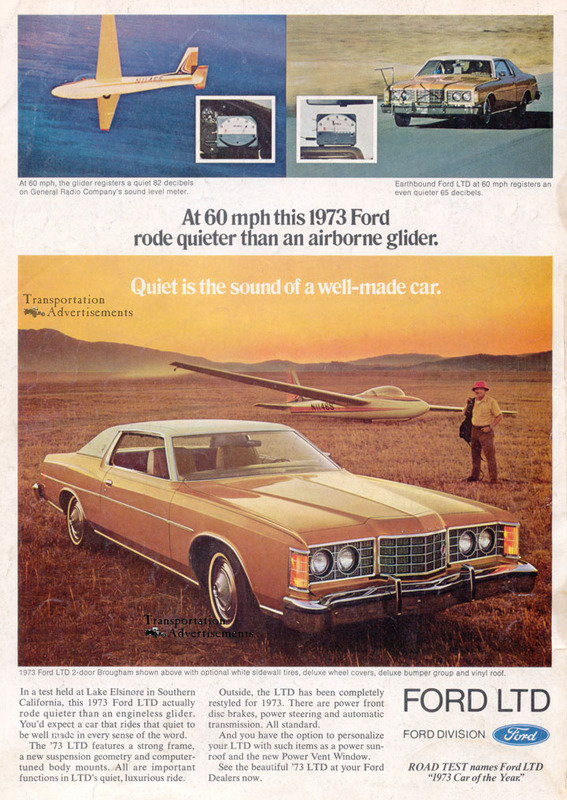 In a test held at Lake Elsinore in Southern California, his 1973 Ford LTD actually road quieter than an engine-less glider. You’d expect a car that rides that quiet to be well made in every sense of the word. The ’73 LTD features a strong frame, a new suspension geometry and computer tuned body mounts. All are important functions in LTD’s quiet, luxurious ride. Outside, the LTD has been completely restyled for 1973. There are power front disc brakes, power steering and automatic Transmission. All standard. And you have the option to personalize yorr LTD with such items as power sun-roof and the new Power Vent Window. See the beautiful ’73 LD at your Ford Dealers now.